There are many reasons why you should choose us, with the main reason being the knowledge and experience that we can bring to the table. We have what it takes to answer any questions that you may have, address any concerns that come up and to successfully pursue your claim to get you the compensation and justification that you need and deserve. We offer everyone a free assessment over the telephone or by e-mail and can pursue most cases with No Win No Fee Funding. We will ensure that we go over everything with you about how the process will work and will continue to work with you to ensure that you understand everything as we go. We have substantial experience in handling all kinds of successful solicitor’s negligence cases. We usually can offer No Win-No Fee funding, subject to assessment. Most of our cases are proceeding with this form of funding. We offer a free enquiry and assessment without obligation. We care about you as well as your case and look after your interests first. The breadth of our previous experience in dealing with most kinds of legal work usually enables us to initially analyse and advise on the legal merits WITHOUT OUTSIDE EXPERTISE and enables us to pursue worthy cases with confidence. We are not connected or associated with any other legal firms in any area. We are totally independent and will pursue worthy cases vigorously without fear or embarrassment. We are used to handling cases involving very large amounts of documentationand complex issues and those involving or based upon other parties and/or professionals, including Doctors, Barristers, Surveyors and Financial Advisors. The fact that lawyers are professional people skilled in the law and have costly professional Insurance, which provides expensive legal assistance when a claim is made, is often influential in discouraging just claims from proceeding. We can redress this imbalance using our vast experience gained over decades. We are used to Insurer’s ways in defending solicitor’s negligence claims and the types of defence often raised by them, including but not limited to, limitation of actions/extent of retainer/scope of duty/causation/no loss/remoteness and foreseeability/failure to mitigate loss, arguments. We are experienced in handling cases of substantial value but are also able to assist Client’s with cases involving smaller claims. We are experienced at handling cases involving many different firms and actions against solicitors for their negligence in handling or not pursuing a solicitor’s negligence action, sometimes several in succession. 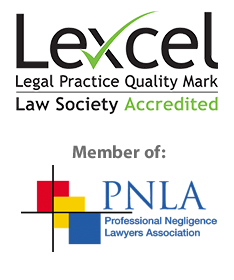 We run all cases either directly through or under the close supervision of Mr Wilkinson who has over 25 years experience in dealing with solicitor’s negligence claims and is a member of the Professional Negligence Lawyers Association. We are familiar with the rules and regulations on Client service and can provide advice on compliance issues, conflicts of interest, and complaints to the Legal Ombudsman and compensation for inadequate professional services. We use an analytical approach to complex matters and consider both the academic and practical perspectives in achieving accuracy in the legal advice and practical guidance we give our Clients. We specialise in these cases. This does not mean that we have a large mix of cases including professional negligence against Solicitor and other Lawyers. This is the major part of our practice and we deal with Solicitor’s Negligence cases on a day-to-day basis.